To get to this page, to to Reports → Messages Received. 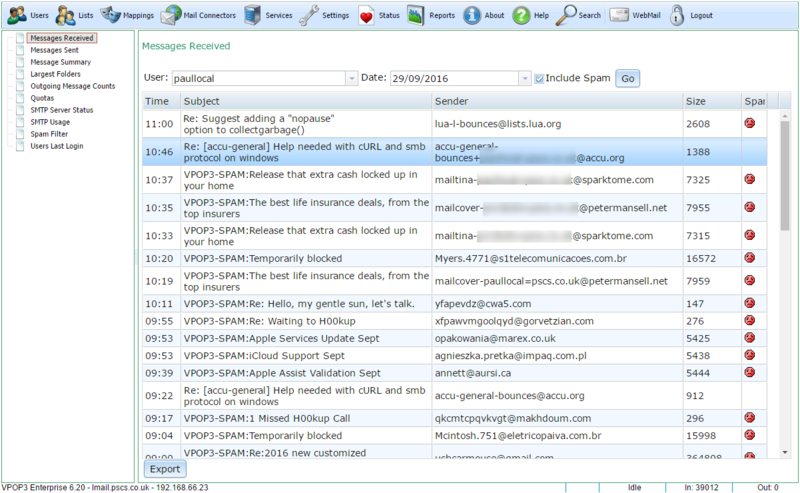 This report lets you see which messages a specific user or email address received on a certain day. This report requires Historical Logging to be enabled. Select the destination user in the User box, and the date in the Date box and press the Go button. If you check the Include Spam box, then the report will include quarantined messages as well. You can not view the message content itself because that is not logged due to space constraints. If you have Message Archiving enabled, you can search for the message in the Message Archive. At the bottom of the page is an Export button which will let you download the table contents as a CSV file in case you want to load it into Excel or some other analysis software. We are always open to suggestions for other reports to add, as long as they will be generally useful to other VPOP3 users, not too complex, and the relevant data can be captured without adversely affecting performance or disk usage. Please contact us with your detailed suggestion. The current reports are reports which have been requested by users or which we have found useful ourselves.